Digital marketing has proven to be a dynamic tool for enterprises to reach, convert and consistently engage with their target audience, while getting the most optimum returns on investments. In fact, businesses utilizing a digital marketing strategy stand to grow 2.8 times more in revenue than those who do not. Search engine optimization (SEO): 93% of all website traffic came from search engines (BlueOpps). Content marketing: 71% of readers said they were annoyed by content that came off as a direct sales pitch (Marketing Week). Mobile: 52.52% of all searches begin on a mobile device (GlobalStats) as studies show that 69% of time spent online is on a smartphone (LSA Insider). Social Media: 20-40% of customers spend more on brands with a strong and engaging social media presence (Social Media Today). Email marketing: The average return for email marketing in the UK is £38, and in the US, $44 (Word Stream). With up to 72% of sales projected to be completed on a mobile device by 2019 and an exponentially growing cyberspace population, the challenges for digital marketers can be daunting. From SEO and content development, to social media and email marketing, keeping track and measuring available data can be overwhelming. 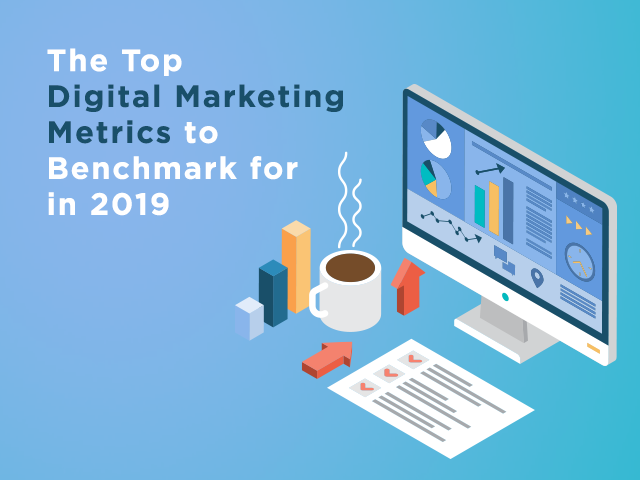 To effectively gauge your ROI and maximize resource-allocation, below are the top digital marketing metrics on which marketeers must keep a watchful eye. Keywords are the building blocks of SEO. Knowing what your prospective customers are searching for and why is vital to creating content that will attract traffic and haul in leads that convert. This is called fulfilling ‘search intent’, which can be primarily classified as either informational, navigational, or transactional. While it is good to rank for the first two categories, businesses stand to gain the most profits by ranking for transactional queries as the motive to fulfill an action (i.e. order, download, buy) is already at hand. There are a variety of SEO tools that can help you identify and analyze which keywords work best. One key tactic you can employ is to narrow down which long-tail keywords or specific search phrases can be used to target a niche demographic. But at the end of the day, keep in mind that keyword optimization is all about outranking the competition, which requires an in-depth look at your rivals’ keywords. It may be tempting to celebrate a million total visits and hail your online marketing game plan a success. But to properly assess and strategize, visitor traffic must be broken down by source to find out which channels are most rewarding, and which ones need improvement. Major sources of traffic can be categorized as organic, direct, paid, referral or social. A diverse traffic source report is indicative of a well-functioning digital strategy—revealing that your content is reaching its audience across multiple touchpoints. Being able to narrow down where your ideal traffic is coming from is just as important as knowing who they are. Customer acquisition cost, in principle, is the total amount spent on converting a lead into a customer. This is typically calculated by adding all the costs incurred for a campaign and then dividing it by the number of customers it generated. Knowing your CAC can help determine whether your company is earning enough revenue. The more this cost is reduced, the higher your profit margins. Make sure to compute your CAC in a manner as specific as possible (such as narrowing down by channel and time-period), and familiarize yourself with customer acquisition efficiency analytics to gain a more accurate picture. The more pages a user views on your website, the stronger their engagement with your brand/company, and thus a higher likelihood for conversion. It is usually evaluated in terms of average time spent on site. Maximizing your website’s pages-per-session rate is a combination of providing relevant content, a great user experience, and interactive design principles. Sometimes, it can even be as simple as speeding up your website. Well-executed display ads are still a sure-fire way to drive users to your online platform. Metrics generally pertain to traffic, conversion, cost per conversion, and cost per thousand impressions in the context of the ad. But how do you do it right when many argue that most consumer eyes are trained to tune out ads? The goal is to make your display ads stand out. Complement eye-catching visuals with creative copy that communicates your brand’s personality. Ensure the creative renders seamlessly across different devices, especially on mobile. Lastly, make the most out of tools available on social media platforms that can help you zero-in on precise target audiences. Believe it or not, email (and not social media) is still the top performing digital marketing tactic — with an ROI of 3,800%. This is because along the conversion journey, email marketing targets leads or users that have already subscribed or opted in. Your email list is filled with hot leads. It’s also the most personal that marketing can get for a customer. To measure your email marketing campaign’s performance, look at how many people are reading your email (open rates), how many emails don’t get sent across successfully (bounce rates), and how many readers are getting converted (conversion rates). These, among other email marketing metrics, can help you refine your content, clean up your list, and work on achieving your bottom line. Last but not the least, do not neglect your social media platforms and make the mistake of operating on a one-size fits all strategy. With a variety of distribution channels (Facebook, Twitter, Instagram, YouTube, LinkedIn, etc.) and channel-specific management tools, comes the need for tailored approaches. Glean insights from your past year’s performance. Aside from recognizing which platform has led to the highest engagement or most conversions, it is important to initially identify what are your desired results. Do you want to build awareness and increase leads? Is your goal to create brand loyalty and boost sales? Specific objectives determine the metrics you need to track. They can also help you decide which social media monitoring tool is the most ideal for your requirement. Artificial intelligence is on the rise. These technologies range from the growing use of chatbots for customer service and order completion to voice interaction with virtual assistants such as Alexa, Siri and Google. Data-driven marketing is intensifying. With greater availability of analytics and metrics, big data will be the fuel to a potent strategy that will deliver optimized conversion rates. Social media still delivers. Different platforms are now segmented by demographics—Facebook for the older generations and Instagram for the under 30. New features are introduced regularly to boost engagement. Make sure you stay attuned to the trends and leverage it for your brand. Impersonal email marketing is not going anywhere. This strategy needs to be improved upon through better personalization, timing, funnel-friendly messaging, and automation. Analyze which aspects of your email marketing need more work and find the right tools that can help you achieve your goals. Content is still king. No matter how meticulously you’ve planned your digital marketing strategy, its success rate will only be as good as your content. Personalize it, get even more creative with it, and make it valuable to your audience. Now that you’re well-aware of the digital marketing trends and metrics you need to leverage in 2019, a key point to remember is that none of them work in silos. Complementing strategies that convey a unified message across platforms will ensure optimum results. Thank you so much for sharing this valuable blog.